Introduction: Steroid compounds are widely distributed in nature throughout scientific history. Living organisms such as animals and vegetables have steroids that show a significant effect on their vital activities. Sterols are key components of all eukaryotic cell membranes. Methods: Steroidal compounds; 3β-oxo-[1’,3’,2’-oxathiaphos-phalidine-2’-one] stigmast-5-ene and 3β- oxo[1`,3`,2`-dioxaphosphalidine-2`-one]-stigmast-5-ene were successfully prepared using easily accessible 3β-hydroxy stigmast-5-ene with phosphorous oxychloride (POCl3), 2- mercaptoethanol/ethylene glycol and triethylamine (Et3N) in dry diethyl ether. Products were obtained in semi-solid state and characterized using physicochemical techniques. Results: The results of the bioassay showed that the synthesized compound containing the sulfur atom had antibacterial activity. 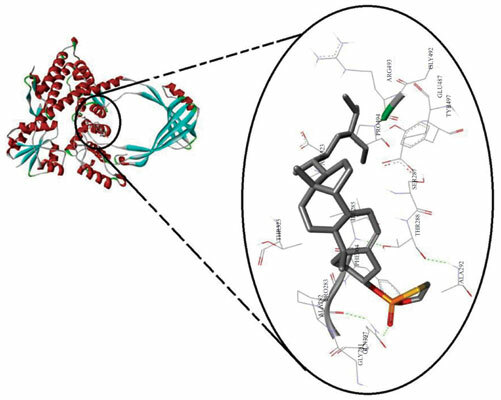 Molecular docking was also done in order to show in silico antibacterial activity and to make out the probable binding mode of compound with the amino acid residues of protein. Conclusion: The results of the docking study showed that synthesized compound 2 had minimal binding energy with substantial affinity for the active site. Cyclization, stigmasterol, 2-mercaptoethanol, phospholidinones, docking, Steroidal Compounds.